In 2014, we were given the opportunity to share the message of FIRST on a national level. 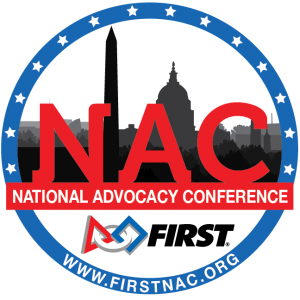 The Flying Platypi was invited to represent NC at the 1st Annual FIRST National Advocacy Conference in Washington, DC, organized by Team 27, RUSH. As 1 of 13 teams that first year, we promoted the FIRST mission by lobbying both senators and multiple representatives from our state, asking them to support funding for after school STEM enrichment programs. In 2015, we returned to Washington to advocate for the re-authorization of the Elementary and Secondary Education Act (No Child Left Behind Act), which passed in December of 2015. After the act was passed, it was time to fight for full funding. In 2016, we lobbied for full funding of the Elementary and Secondary Education Act. We have maintained contact with our representatives and invited them to various NC events. Since 2012, we have completed over 150 demonstrations and outreach events, including participating in local Maker Fairs, parades, and university sponsored events statewide. In the last 3 year alone, over 155,000 people have seen one of our robots in person and hundreds have had the thrill of driving one (including a midnight ramble around our state capital). We have also. We have also volunteered multiple times at our local Miracle League, a baseball league for children with disabilities. For the past two years we participated in the Tour de Tanglewood cycling event, raising over $5,000 for MS treatment and research. Events like this teach students that leadership does not stop with FIRST, but extends to all segments of our community. Many Platypi members were initiated into FIRST through local FIRST Lego League programs. Collectively, our team members have 50+ years of experience on FIRST Lego League teams. Veteran team members have volunteered at Lego robotics camps for students in PreK-8th grade held at the Greensboro Science Center, have volunteered and reffed at numerous FLL events, and helped start and mentor FLL teams. Over the last 6 years we have worked hard to spread the excitement for FIRST Lego League; starting 17 FIRST Lego League teams, fully funding 11, mentoring 26, and volunteering at numerous FIRST Lego League events across our state. The Flying Platypi launched ‘project brush-bot’. A brush-bot is a mini robot made of a toothbrush head, motor, and a battery. When assembled, the brush-bot dances! Kids can then decorate their bots with materials we provide, and we teach them the underlying science behind the brush bots. This project was met with great enthusiasm from parents and young students at every event. It also has served as a fundraiser to help us continue to promote the FIRST mission. The Flying Platypi strive to spread the message of FIRST to those who may not have an opportunity to hear it, regardless of nationality. In 2013, our team started the first four unofficial First Lego League teams in Boquete, Panama, a rural mountain community, by shipping four NXT kits and FLL challenge mats to a local school. They are still going strong! In 2015, we successfully started four First Lego League teams in Piedras Negras, Coah, México. Our team delivered EV3 kits and challenge mats and provided the school with a robot design engineering curriculum to help expand STEM opportunities year-round. We also sent EV3 kits along with mentors to India and the Philippines to spread FIRST’s message across continents. The Flying Platypi appreciates all its team members, but as we grew we realized that we were not reaching one underserved group in STEM. We only had two female students when we started in 2007. Since then, we’ve expanded to an almost equal ratio of males to females. We have partnered with AAUW (American Association of University Women) and are currently preparing our curriculum to teach at the national annual Tech SAVVY event hosted at the University of North Carolina-Greensboro. We will host the robotics portion of the camp. We have grown from a team of only nine students and two mentors in 2008 to a fully functioning, community-based team of 23 students and nine mentors. In 2009, The Flying Platypi legally incorporated and obtained 501(c)(3) non-profit status, becoming the first FRC team to do so in North Carolina. Becoming a non-profit organization helped us achieve team sustainability, and opened many fundraising avenues to support ourselves and other local FIRST teams. Our team has student-based leadership working alongside adult mentors who provide technical and non-technical guidance. Our team’s success has been significantly bolstered by our gracious sponsors, many of whom have been with us for many years. In 2019, The Flying Platypi began working with teams across North Carolina to promote awareness about FIRST Robotics in the state legislature. We created a video series describing some of the federal legislation related to STEM education funding, and why it’s important for FIRST teams.